Located inside the newly renovated Holiday Inn, this restaurant provides a family-friendly dining experience with specialty burgers you will keep coming back for! While there are six gourmet burgers to choose from, guests are also welcome to "create their own" with 4,320 possible combinations. 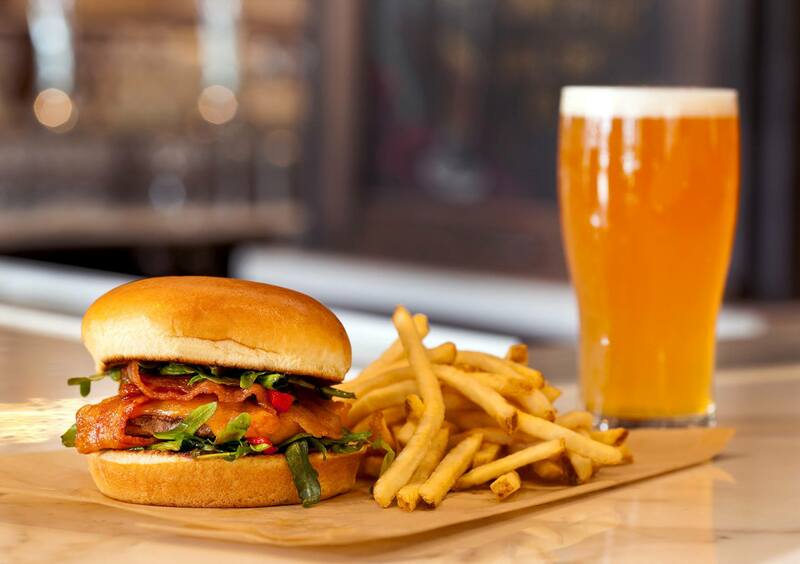 Burger Theory also provides a large selection of craft beers, so whether you're staying at the hotel or visiting the area, don't forget this delicious option to satisfy your cravings! Of the half dozen burgers offered here, most are made with two patties of fresh ground chuck. The “N’Awlins” burger comes with gulf shrimp, smoked Gouda, and Cajun mayo, while the “Thai Burger” has Asian slaw, pickled veggies, and curry mayonnaise. Can’t decide between a burger or BBQ? Then try the “Surry Burger,” a grilled chuck patty smothered with North Carolina barbecue, homemade coleslaw, and melted cheddar cheese. Feeling nostalgic? Then grab a burger at one of the first curb-service car hops in the region: Monty's Penguin. First established in 1946 in Downtown Newport News, the restaurant moved to a second location in 1963, and then to its present location on Warwick Boulevard in 1974. Its hamburgers range from the “Double” and “Jumbo” to the “Double Jumbo” burger. From the look of its reviews, Monty’s Penguin has been a neighborhood favorite for generations! Judging from the numerous “Reader’s Choice Awards” on its website, it’s pretty obvious that Rocky Mount BBQ is a locals’ favorite. Established in 1953, Rocky Mount BBQ serves North Carolina-style barbecue, along with “saucy” pulled pork barbecue (and like many other restaurants that specialize in barbecue, Rocky Mount BBQ serves burgers, too!) More than two dozen side dishes and vegetables – from black-eyed peas and candied yams to corn pudding and deviled eggs – along with homemade desserts round out the menu. It shouldn’t surprise anyone that a restaurant called “Smoke” would serve both BBQ and burgers, right? So in the interest of time and space, we’ll just focus on the barbecue for now! Smoke offers slow-cooked pulled pork (smoked “low and slow,” according to their menu), pulled BBQ chicken, and shredded or sliced beef brisket. Viking Burger is owned by David Coman, who opened the restaurant in 2014 after what he called a culmination of “experience, life lessons, and an undying love of hamburgers!” According to Coman, Viking Burger will “slay your hunger without pillaging your pocket … and it will be the “best burger you ever put in your ‘mouf!’” Choose from single, double, or triple burgers with names like Ragnar Burger (cheeseburger topped with lettuce, onion, tomato, and pickle); Odin Burger (cheeseburger topped with Viking Sauce, onion torc, and pickle); Thor Burger (cheeseburger topped with grilled onions), Loki “Burger” (a breaded chicken patty sandwich); and Freya “Burger” (a grilled portabella mushroom sandwich with grilled onions and peppers). The restaurant’s namesake, the Viking Burger, is a cheeseburger topped with homemade Viking Sauce. What-A-Burger, established in 1950, specializes in “counter-served” burgers, some stacked with multiple patties. The Newport News location was the first in Virginia, and it is still in operation today. What-A-Burger is known for burgers that are larger than what’s found on the typical fast-food menu, cooked-to-order within sight of waiting customers, and affordable. For example, a “Hamburger All-The-Way,” which includes mustard, lettuce, tomato, pickle and onion, runs less than $4; add fries to that burger and pay less than $6; and if you’d like to throw in a medium drink, your total will be less than $8. We call that What-A-DEAL!! If your mouth is watering and wanting more, see this full list of where to Sip & Savor in Newport News and plan your trip today.